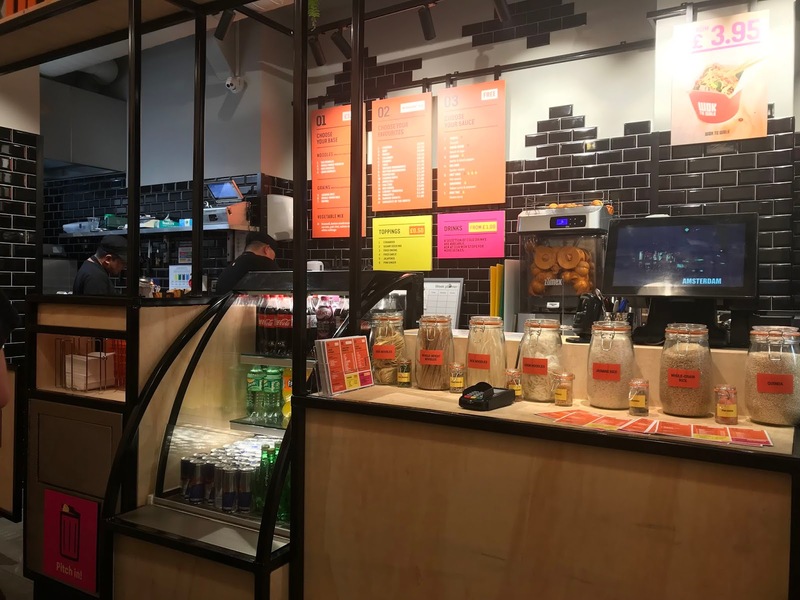 With chains all across the globe, Wok to Walk have finally arrived in Birmingham, and it is fair to say that it is making quite the name for itself in its little home on New Street! I was recently invited along to step behind the scenes at Brum's coolest new spot, and I wasn't disappointed. 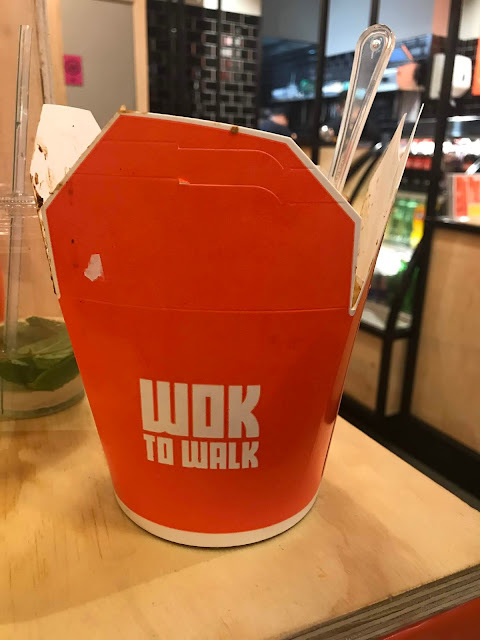 Wok to Walk is quite small, with a handful of stools to perch at, but the team of staff are super welcoming, friendly and talked me through the whole process, as well as the history of the company and how they have found themselves in our wonderful city. Before I get onto the food, I've just got to tell you that this place also has plugs and charging points to use whilst waiting for your dish, which if you're anything like me, will make you super happy! 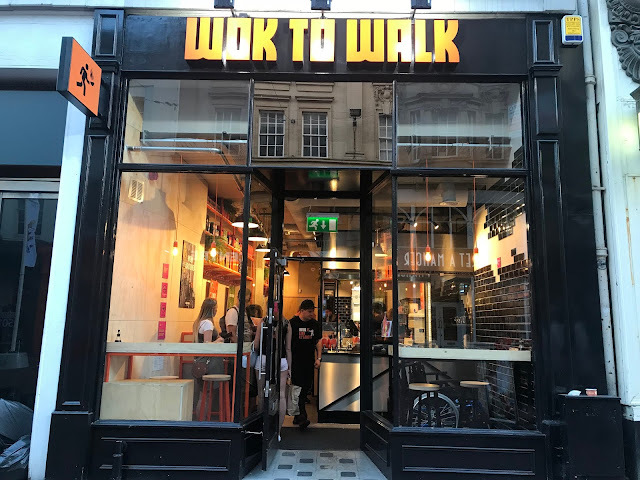 Although Wok to Walk is the ideal city centre lunch location - just a short walk away from both the Bullring, Colmore Row and Broad Street - it is also open until late at night, making it perfect for dinner too or even a post-night out snack. 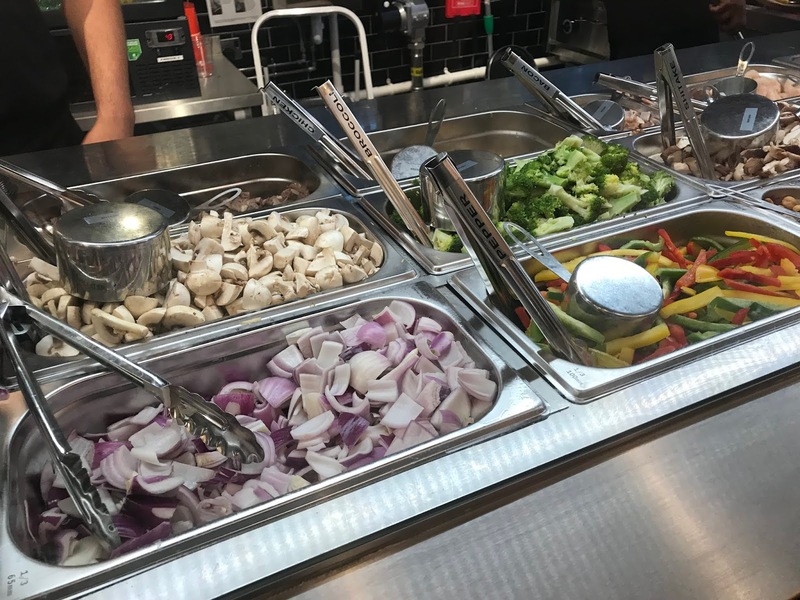 Everything the staff use is freshly made on site, and to make the place even better, they also give out any leftovers to the homeless. So, lets get to the food. The Wok to Walk team prepare plenty of nifty orange takeaway boxes beforehand, and each customers box is full to the brim of flavour. You start out choosing your base, with a selection of four different types of noodles with fresh vegetables and egg, three different types of grains, again with fresh vegetables and egg, and vegetable mix. Then, you move along to flavours. With everything from chicken, beef and bacon through to calamari, tofu and cashew nuts; there is a huge selection of flavours to choose from to add to your box, which is super strong and sturdy, so you can take it on your travels without any spillage. You then move along to the sauce section, where you can choose from Tokyo Teriyaki, Hong Kong Sweet & Sour, Beijing Oyster Sauce and many more to make your box even more delicious. There are also a selection of toppings, including fried onions, jalapenos and pink ginger. For me, with the help of the Wok to Walk team, I went for the base of Egg Noodles, topped with Chicken, Peppers, Cashew Nuts, Red Onion and Bamboo Shoots. Not only was it totally delicious, and super fun to get behind the flames (even though I was convinced my hair was going to set on fire), it was also packed full of flavours and was incredibly filling! 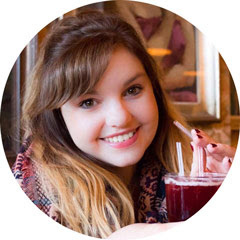 There is also a great selection of drinks, from homemade lemonade, fresh orange juice and soft drinks to a handful of alcoholic options, Wok to Walk have what the beverage you need to enjoy alongside your meal. Price wise, Wok to Walk is a little more expensive than your average supermarket meal deal, but for the amount of food you get, you won't be craving those 3pm snacks thanks to your little orange box. For the base, it's £3.95, and the flavours and toppings come in at an extra cost, so the final price of your box really comes down to what you choose to order - so it can be as cheap or as expensive as you wish. But with the sheer amount of choice, it's hard to not want to try every single thing on the menu! Wok to Walk offer a great alternative to other fast food outlets, with healthy options but at the same speed you'd wait for a burger and chips. I can also guarantee this place will fill you up for much longer too. It's cool and a refreshing touch to the city's food scene and I hope they open more branches across the city soon!